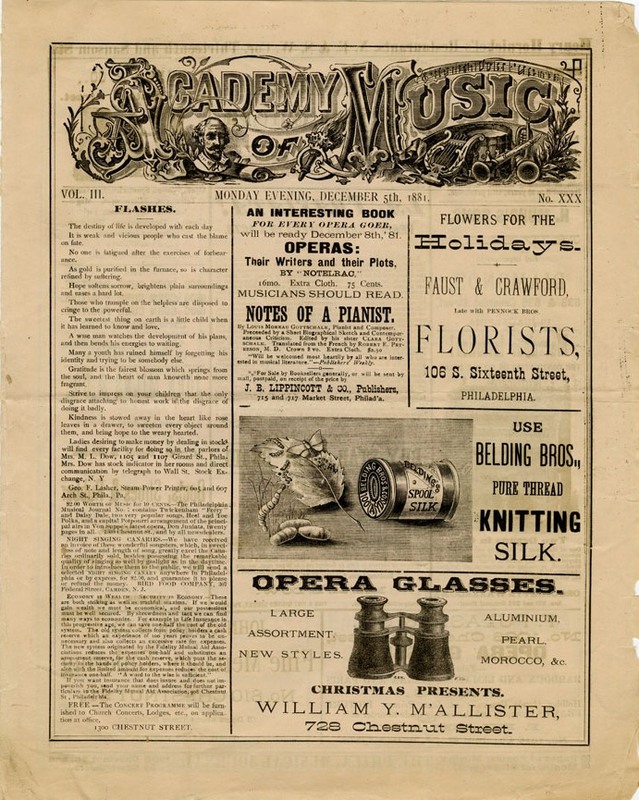 May 20, 2010 by Cary H.
HSP has a large collection or programs, playbills, and other ephemera from Philadelphia’s Academy of Music (once called the American Academy of Music), dating from its beginnings in the late 1850s to the late 20th century. The collection was recently adopted and is my current processing project. 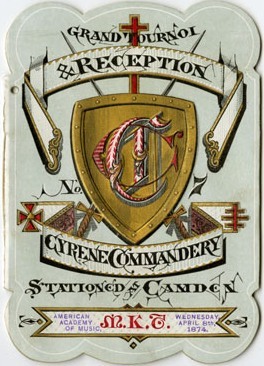 Though I’ve barely scratched the surface (having just completed rehousing 13 of 157 boxes), the collection is already proving to be a joy–it presents a veritable history of performing arts and artists at the academy, as well as a plethora of creative advertisements, typefaces, and graphic designs of bygone eras. 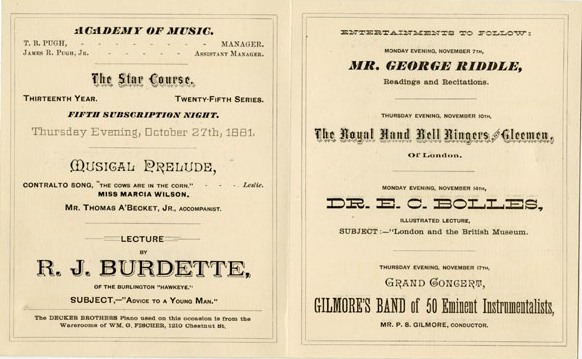 Hidden among the many playbills and programs is a wonderfully artistic array of dance cards, programs, and other advertisements for meetings, benefits, and balls held at the academy by numerous local clubs and associations. 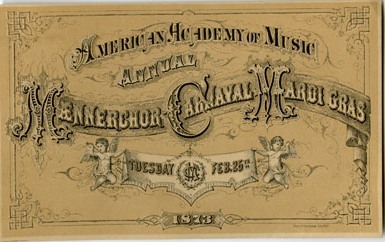 Though the academy was originally designed as an opera house, it became a hub for all forms of entertainment from theatre to ballet to vaudeville. 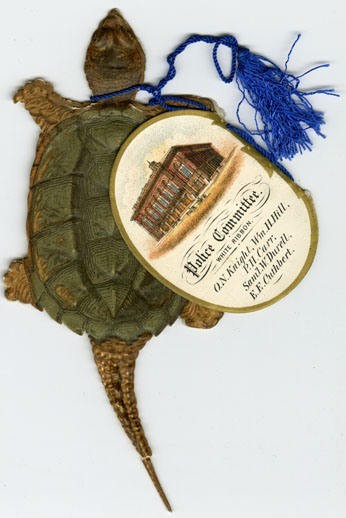 The academy also hosted school commencements, lectures, political conventions, gymnastic exhibitions, reunions, and receptions. 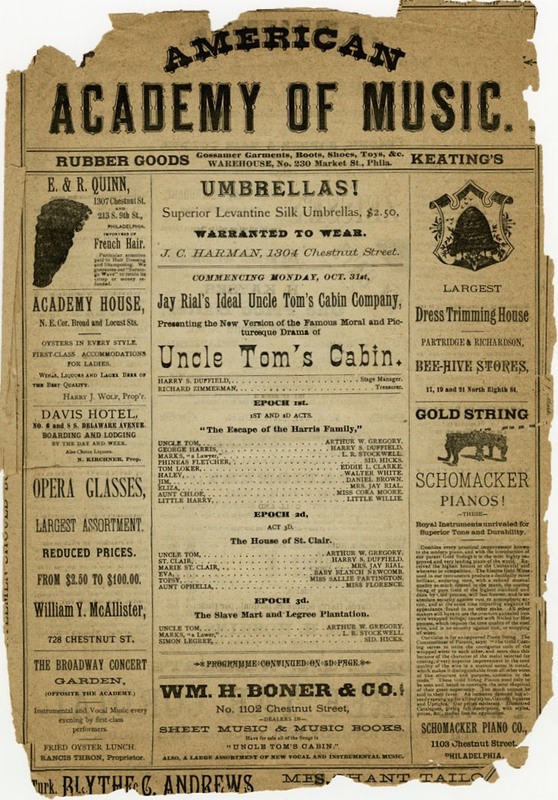 Today, the Academy of Music, along with the Kimmel Center for the Performing Arts, is home to the Philadelphia Orchestra, Opera Company of Philadelphia, Pennsylvania Ballet, the Chamber Orchestra of Philadelphia, American Theater Arts for Youth, PHILADANCO, Philadelphia Chamber Music Society, and Peter Nero and the Philly Pops®. No doubt that further processing will reveal more surprises! Both processing and the collection’s finding aid are scheduled to be completed later this summer. There are few things in conservation work that excite me more than a substantial transformation of an item. When I pulled out the bundles of dingy paper from an old box, it was exciting to envision them clean, flat and arranged neatly in folders! The three bundles were bound in groups of roughly 100 sheets using a ribbon. After removing the ribbons, I dry-cleaned the pages using eraser bits and a vulcanized rubber sponge. The pages were then washed in deionized water and flattened in job presses. 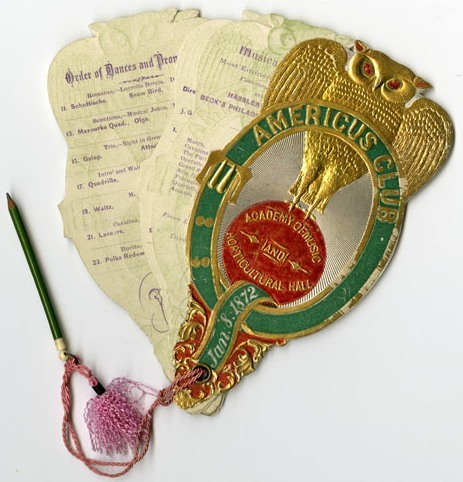 These items are part of the A. A. Humphreys collection and, as a fan of printing history, I found them especially interesting to work with. Proof sheets were printed as drafts to be revised for final printing. These sheets contain not only edits, revisions and marks by the proofreader, but I was excited to see the printer’s fingerprints and the use of dingbats and excess type to fill in spaces. Out of curiosity, I pulled the bound version of the 1864 printing of the Memoirs of HSP to see what revisions were made. September 23, 2009 by Cary H.
Won’t you step into this cloud of steam? 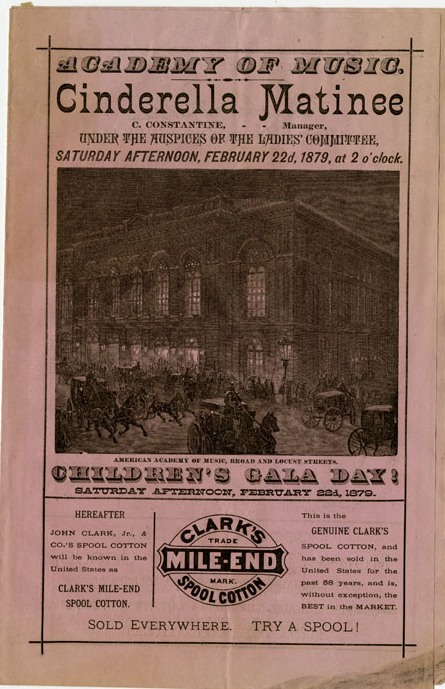 While going through a few boxes of uncatalogued graphics, I came across these interesting clippings about and an 1869 flyer advertising a revolutionary new way to get from point A to point B. This particular contraption was invented by P. Dederick and I. Grass of Newark, New Jersey. 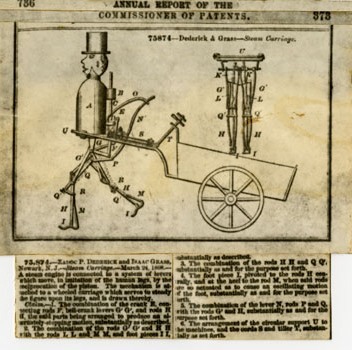 “Steam Man” was a steam-powered carriage led by a human-shaped machine. Its body held a boiler that was connected to a piston and series of levers and cranks. When enough steam was generated, the piston activated the attached mechanisms and the machine walked forward. Steam-powered travel was hardly a new concept in 1869. Robert Fulton, a native of Lancaster County, Pennsylvania, is widely recognized as the inventor of the first commercially-viable steamboat in America in the early 1800s. However, decades earlier, several inventors, including Virginian John Rumsey and John Fitch, who born in Connecticut but eventually settled in Bucks County, Pennsylvania, began working on their own steamboat designs. 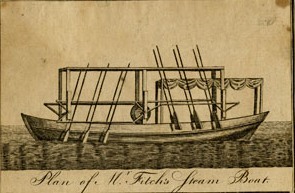 Fitch completed his design in 1787, and his steamboat (pictured below) was among the first to successfully navigate the Delaware River between Philadelphia and Burlington, New Jersey. Fitch and Rumsey battled over patents for their boats; and Fitch eventually won a patent just for his design. Despite his success, Fitch didn’t possess enough money to fund the construction of his steamboats. 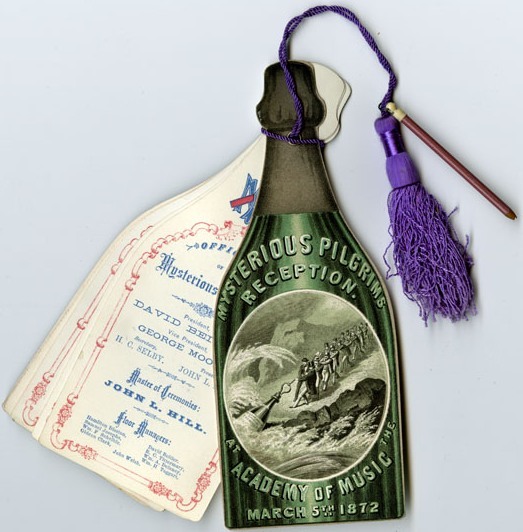 Fulton’s success in the steamboat business no doubt inspired others to invent ways to expedite travel. 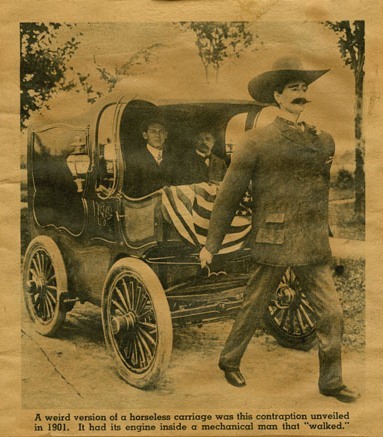 The “Steam Man” was just one example that never quite took off; even though, as you see from this clipping below, the idea stuck around into the decade that saw the invention of the automobile. 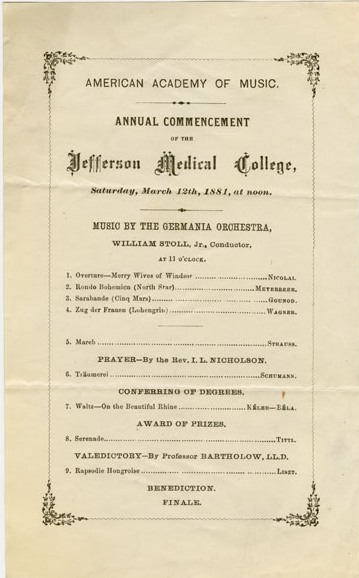 HSP has several collections relating to people and their inventions, including the John Fitch papers (#208), the Mary Hallock Greenewalt papers (#867), the Penrose Robinson Hoopes papers (LCP), and the Christian F. Gobrecht papers (#241) For a interesting look into the history of machines like Steam Man, check out these sites: http://www.bigredhair.com/robots/index.html and http://cyberneticzoo.com/?page_id=164.